Canon fans might be confused when buying a new digital SLR camera, especially for beginners. Canon has just launched two variants of DSLR cameras simultaneously, namely the Canon EOS 750D (Rebel T6i) and Canon 760D (Rebel T6s). 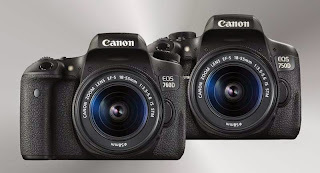 If you are confused, then it is very reasonable due to replace the EOS 700D, turns Canon has launched two models at once, the Canon EOS 760D and 750D, rather than one. The important thing for photographers when choosing one of these cameras is because of all these new cameras, also very nice if you use to make videos in full HD resolution. Are there any significant difference on both cameras? 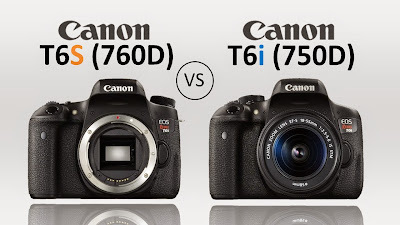 The 750D is perhaps closes in terms of design and operation to the existing Canon 700D, while the 760D is a new design that fills the gap between the 750D and the larger and more advanced the EOS 70D. 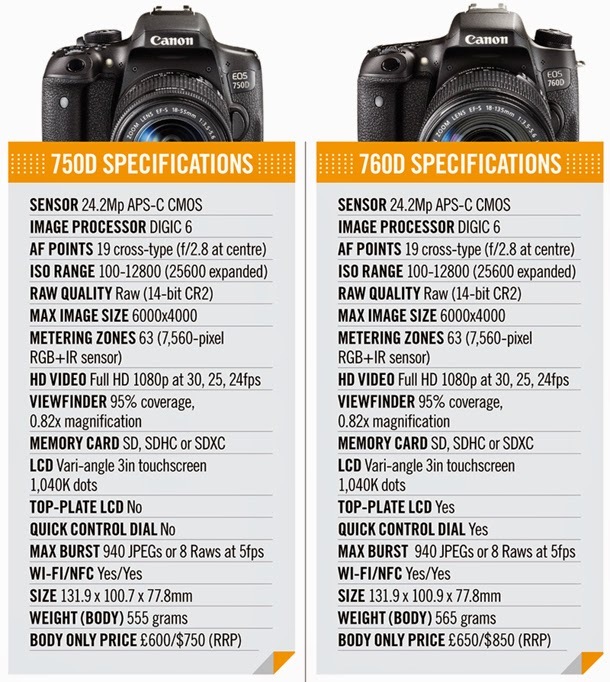 The Canon EOS 760D and 750D both feature a new 24.2MP APS-C CMOS sensor (up from 18MP on the T5i / 700D) coupled with a new 7560 pixel RGB + IR metering sensor for more accurate metering. It could be said that the 750D is considered most appropriate to replace the presence of the EOS 700D, and is aimed at beginners. Meanwhile, the 760D is designed with more experienced photographers in mind and has a few features from Canon’s high-end cameras. Inside, however, both cameras have the same sensor and processing engine. 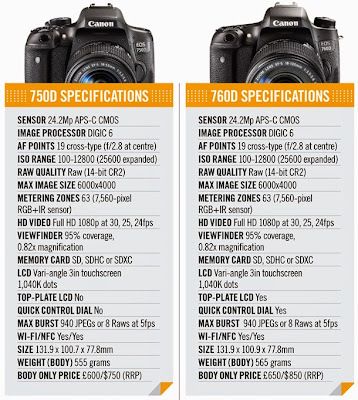 Moreover, the Canon 750D (Rebel T6i) and 760D (T6s) are essentially the same camera as they share many components. You will love the 760D or 750D, because both of them also equipped with new Hybrid CMOS AF III system (with Face detection, Tracking AF, FlexiZone-Multi and FlexiZone-Single modes) for use when images or video are composed on the screen in Live View mode. These camera has a greater number of focusing pixels arranged in a more regular array than in the past, and Canon says it’s about 4x faster than version II (used in the EOS 100D) and two generations ahead of the original Hybrid CMOS AF system in the EOS 700D. The Canon 750D and D760D already equipped with Digic 6 processing engine, both cameras can also shoot continuously at up to 5fps. All camera are very useful when shooting sport. You will enjoy touch screen LCD on both DSLR's. Canon EOS 750D and 760D have a 3-inch touch-sensitive Clear View II TFT screen with 1,040,000-dots and an aspect ratio of 3:2 to match the uncropped ratio of the imaging sensor. However, that the 760D has an electronic level that can be displayed on the screen on the back of the camera, or in the viewfinder, to help keep horizons straight. Wow. Do not worry about it, you can have the 750D at a price more affordable than the 760D. We recommend that you save your money, so you can buy additional lenses are manufactured by Canon or a third-party lens, for example Sigma, Tamron or Tokina. You can become a professional photographer even if you do not use the camera feature complete. Remember the philosophy of "The Man Behind the Gun". You are the master, and to be a master you do not have to have the greatest equipment. There is some improvement on both these cameras, especially sensors and some other features than the predecessor. You can choose one of them, maybe you can see from the features, and of course you can choose based on price factor which is most appropriate for you. If you are wise, you probably chose the Canon EOS 700D, where you will get a great chance to get a discount plus a special gift such as a memory card.